The Inspire Awards are back for 2015, when we're once again partnering with the Evangelical Alliance, and supported by YFC, to showcase believers making life better where they live because of their faith in Jesus. Every month we tell great stories in our magazine, on our website and in social media about people, projects and youth initiatives across the UK making a difference because of their Christian faith. We love to tell these stories of ordinary people doing extraordinary things – because they inspire us. And we hope they inspire you, too. 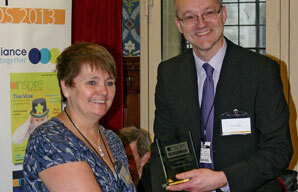 In November 2013, we honoured the winners and runners-up in the 2013 Inspire Awards in London (Individual Award winner Hannah Gibbons is pictured below right, and Anne Clarkson from Projects Award winners Shine Project is pictured immediately right. Read more about their stories here), and now we want to hear about your unsung local heroes that make a difference to the lives they touch. Remember: we’re looking for outstanding unsung heroes rather than already recognised national ministries. There’ll be a prestigious trophy and prize for the winners in each section, plus a high profile awards event in Westminster in November for the shortlisted entries. Make your nomination via e-mail or by filling in the form in Inspire magazine (you'll find one in each issue from February through to our September/October issue). Remember – we’re looking for outstanding entries that will prove an inspiration to others, and who have not received awards or significant national profile before! Closing date for entries is 1 September 2015.